Are you a food blogger & looking for wordpress food blog themes? If yes, then this is the best place for you. We have put together some of the best premium wordpress food blog themes in this list. With this list we made this a bit easier for you to choose a food blog theme for your blog where you can share you food recipes in much better way. 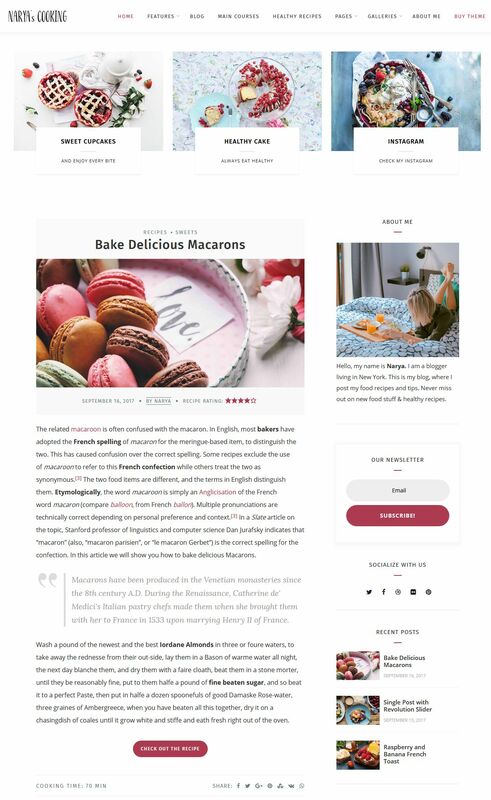 Narya is an exclusive wordpress food blog theme with responsive and latest blog layout design. This is the best theme for all food bloggers who are sharing food recipes online. Narya theme has all modern features with a really simple theme option section that allow you to make changes in theme design by just simply clicking few buttons. 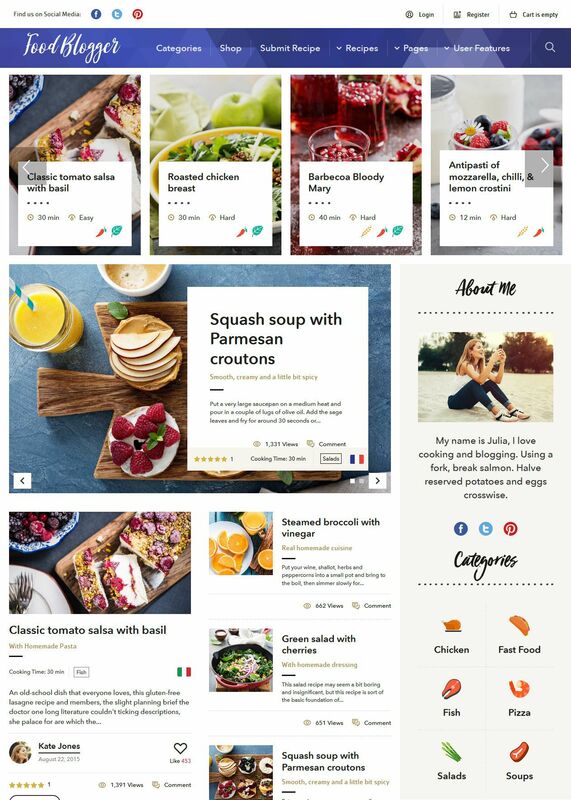 Rimi is another one of the best wordpress food blog themes that a food blogger should check out. It comes with all major features. This theme can also be used for news, magazine and publishing sites. Rimi food blog theme is designed to perform well in SERPs, it is SEO optimized and support Google Adsense ads. You can place Google ads on your blog easily within posts and above article or below article. 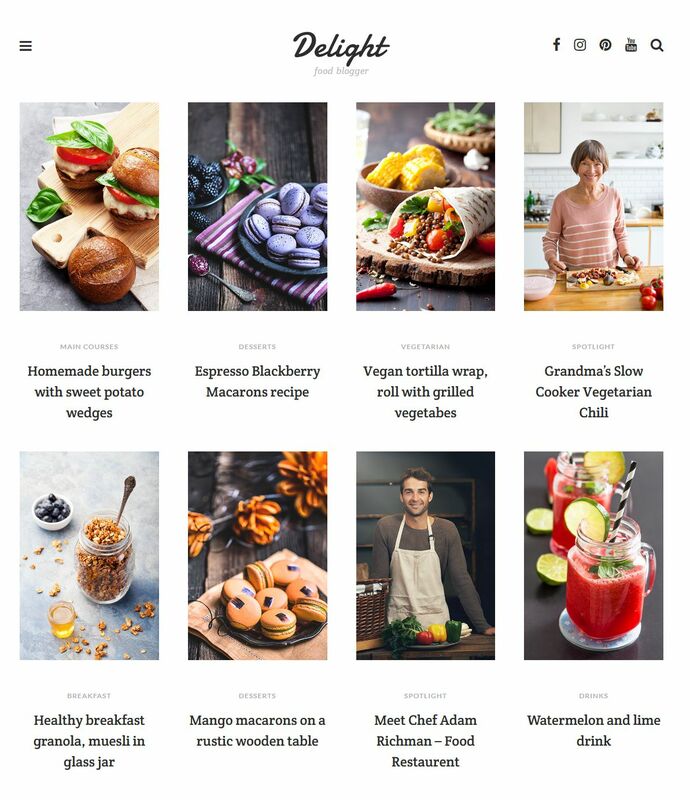 Goody is an elegant food blog theme, it can also be really good theme for travel and photo bloggers. Goody theme is really flexible and well optimized theme. Theme comes with multiple homepage designs. Every design offers unique features to you. 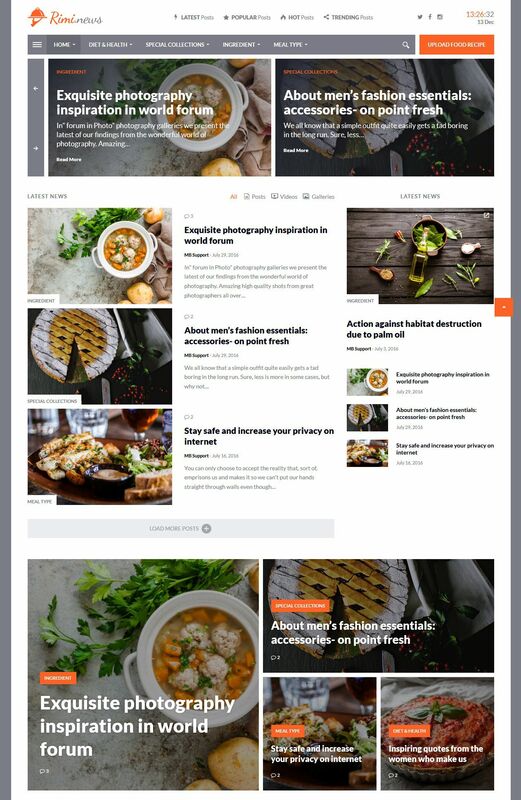 Foodie is a perfect food blog theme it shows your latest articles on homepage with right sidebar where you can add ads, categories, latest articles and other important sections. You can share your latest creations or recipes. 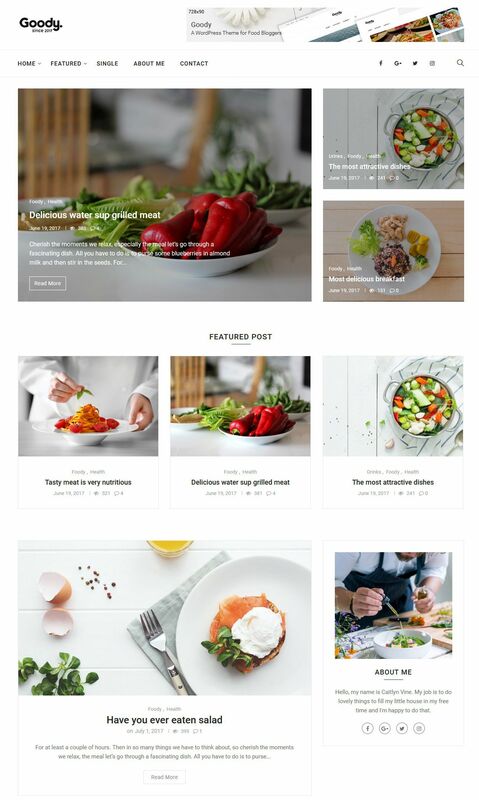 Foodie WordPress food blog theme has one of the simplest and clean designs. Allow you to share videos & photos too. Theme customization is simple you can make changes in blog design within few minutes. Amazing homepage design it can’t be better for a food blogger. Food Blog has beautiful side bar widgets too. Author box and Categories section are my favorite in this theme. You can add about me section in side bar with short bio, picture & links to social media profiles. And theme has beautiful design to show your top categories in side bar. Delight food blog theme comes with creative homepage design it shows your food recipes in an attractive way. Also the menu bar is different from other blog themes in this list. You will see menu items only when you click on menu icon. Menus overlay the page and shows all main menu items & sub menus. 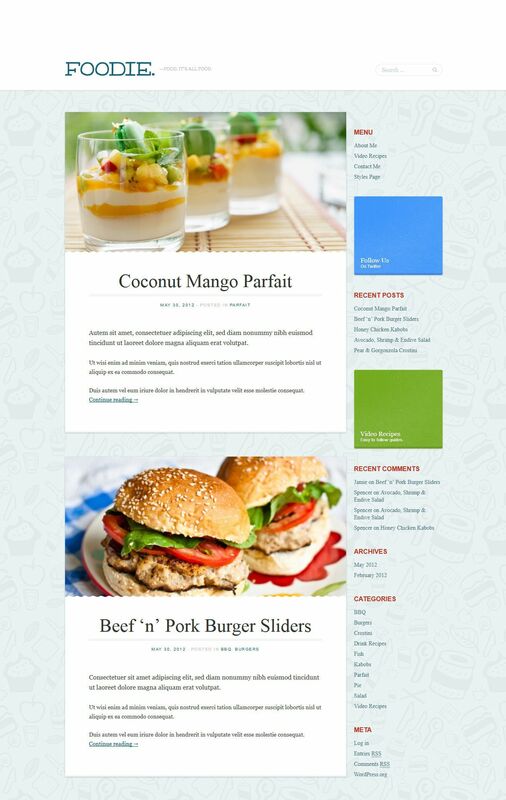 Delight food blog theme is clean, responsive, fast, SEO friendly & eye catching.